Back when Candyology 101 celebrated it's 1-year anniversary, Marvo, who's our producer and the awesome guy behind The Impulsive Buy, sent us a little plaque and some candy to celebrate! Our little goody bags included sweets that were exclusive to Hawaii, and a few tropical flavors of Hi-Chew, which included banana! In case you haven't noticed, I freaking love banana! Now, if you look at my watermark you can tell that these photos are old, and the reason I took so long to post this review is because...I ate the entire package before writing anything up. What can I say? I have no willpower when it comes to banana candies! Thankfully my beloved Asian Food Market just so happened to get these in stock (finally) so now I have a fresh package here to give you all the low-down on this delicious, chewy, addicting goodness. 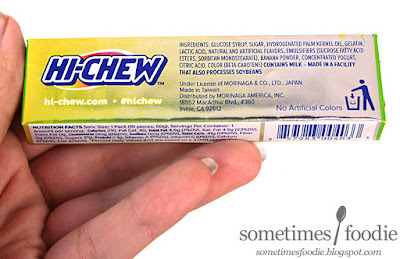 The packaging for Hi-Chew is similar to Bubblicious here in the states, which is one of the reasons why a lot of first-time buyers think this stuff is a type of gum, but it's actually a really bouncy taffy. The outer packaging is a foiled paper, and this flavor in particular has a really nice yellow to a pale metallic gold gradient. Very subtle, but very lovely. 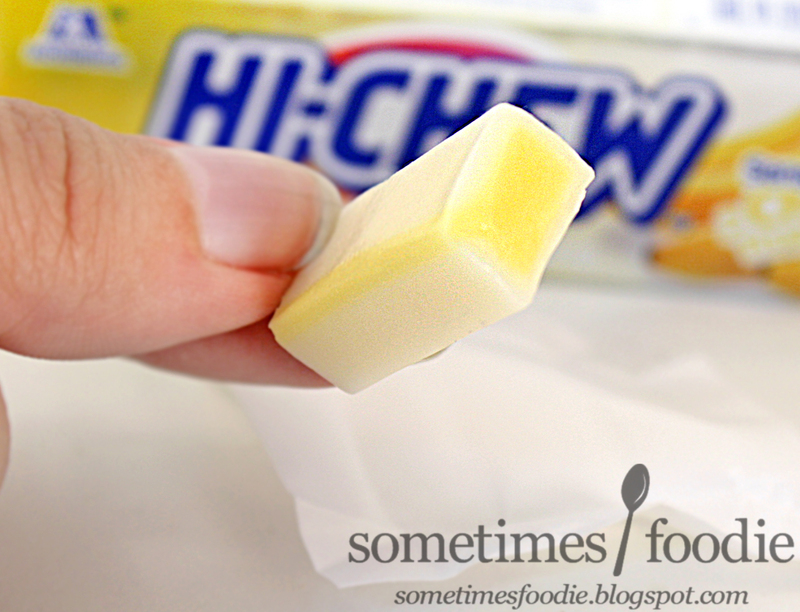 Inside are individual chewy candies wrapped in waxed paper, which again, is similar to chewing gum. The overall design is pretty basic looking when you compare it to other Asian candies, which are typically busier, but it has some details here and there that add to the overall visual interest. For example, the slightly pixelated background on the far right, the lovely realistic banana bunch on the left, and the stark contrast of the blue logo against the yellow-toned background. It's not a package that will take your breath away, but it's pleasant enough. Once unwrapped, the candies inside have a mild banana aroma, similar to banana Runts but it's pretty mild. Nothing too obnoxious, or overwhelming. Hi-Chew has a really elastic chew, similar to bubblegum, but it isn't gum, it's a taffy! When you first put this taffy into your mouth the chew is stiff, but it quickly loosens up to a more gum-like consistency before melting way, and the taste? It's a mixture of fresh, ripe, sweet, authentic banana mixed with a slightly tangy hint of green banana. It's not overly sour, or artificial, or unripe, but it's just tangy enough to make you crave more. 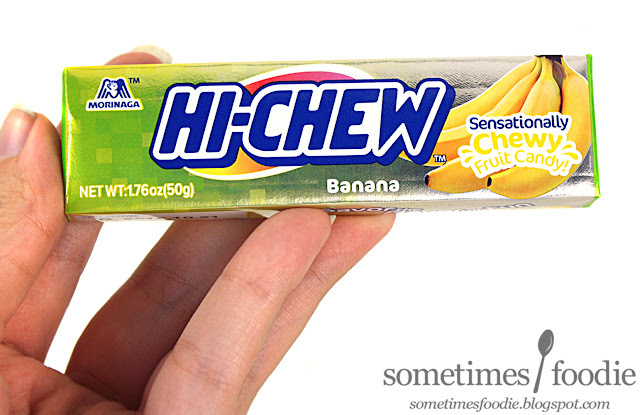 This candy is a MUST for banana lovers. It's chewy, sweet, a little tangy, satisfying and very authentically flavored. I have eaten 2-FULL PACKAGES! If that isn't a ringing endorsement, I don't know what is. EDIT: To add to my own ringing endorsement, my boyfriend LOVED this stuff, and he's a big fan of chewy textures.